This is a double issue of the newsletter to accommodate the reports on the two IDP conferences. The editor will be based in Tokyo for the rest of 1997 and the next issue (No. 10, Spring 1998) will contain reports on Dunhuang holdings in Japan. If you have articles to contribute, or news about forthcoming conferences or new publications, please send them to the usual IDP address. The corpus of manuscripts from Dunhuang in public collections numbers tens of thousands. Among them, say some scholars, are several hundred - maybe even more than a thousand - forged in the early twentieth century. Others say that there are no forgeries from this time: the skills, material and knowledge were simply not available. What is clear is that there is, as yet, no objective means of testing the manuscripts and that, while their assessment remains a matter of individual experience, there will also be some room for doubt. Before embarking on a programme of time-consuming and possibly very expensive tests, it is vital to decide just how important it is to identify forgeries and whether time and money is not better spent on studying manuscripts which are known to be genuine. This has been the approach of Fujieda Akira, Professor Emeritus at Kyoto University and the leading scholar in this field. A very brief survey of some of his conclusions is given below along with reproductions of a few of his excellent photographs. Professor Fujieda was guest of honour at the recent IDP Workshop entitled 'Forgeries of Dunhuang Manuscripts in the Early Twentieth Century' (June 30-July 2, 1997) at which these questions were discussed. The papers and discussion will be published in full in 1998 as volume 3 of the series British Library Studies in Conservation Science (see below). It is hoped that this will bring this issue out into the open and enable all the people in the field to collaborate on the best approach what has been a sensitive topic. The aim of the workshop was to collect and assess all the current information relating to this topic. All the major collections - Beijing, London, Paris and St. Petersburg - were represented and leading scholars came from China, Japan, the USA, Germany, Denmark, Switzerland, and Taiwan. There were also several scientific presentations. Because the workshop was held at the British Library, it was possible for participants to examine original manuscripts. There was much lively discussion and, it must be said, a fair amount of healthy disagreement. It became clear that work already carried out was not always widely known and that, before any further work is done, it would be sensible to pause and make a collective decision on the most efficient course of further investigation. A small group was established to monitor research and all details will be entered on to the IDP database. Important among these are the results of Professor Fujieda's work, most especially his collection of photographs showing typical features of representative manuscripts. A very brief summary of his research with reproductions of some of his photographs is given opposite. A full bibliography on this topic will be available from IDP in the near future. Professor Fujieda's aim in preparing this chronological classification has been to try to identify the features of typical Dunhuang manuscripts from each period. He explains how certain features -- paper type and calligraphy, for example -- changed from the time of the earliest fifth century manuscripts to those produced in the ninth and tenth centuries. The classification only covers Buddhist documents because, he argues, those manuscripts containing official text were stored in the cave library because they had been recycled: the verso being used for Buddhist text. The calligraphy of manuscripts of this period show the transition between the li and kai scripts. The kai script used at the end of this period is still different from that found in Sui and Tang dynasty manuscripts (types B and C) because a different brush was used. The brush used at this period was quite hard, made of deer hairs mounted in a wooden shaft. Long fibres are visible in the paper (termed 'Northern Hemp Paper') and it is believed that hemp cloth was the original material. The calligraphy is in kai script but the paper (termed 'Southern Hemp Paper) is finer (0.08-0.09 mm) with few visible fibres. Standard size sheets were used depending on whether the manuscript was Buddhist (26-28 cm x 40 cm) or official (31-32 cm x 40 cm). The hemp was almost certainly pounded before use. By this time rabbit whiskers were mounted on a bamboo shaft to produce a softer brush, so that the ink coverage is better. Typical of this period is Or.8210/S.81, shown above and below (detail). N.B. All photographs by Professor Fujieda. During the reign of Taizong (627-649), the Director of the Imperial Library, Yan Shiku, criticised kai characters as not conforming to the li style which appeared in Shuowen zezi. Several hundred characters were corrected and between 671-677 the court produced correct versions of two sutras (one being the Diamond Sutra) which were distributed nationwide. There are over 30 copies extant in Dunhuang which exhibit the new forms of characters. It is possible to distinguish therefore between old and new kai styles. The new style is called Tang kai.This period also contains manuscripts written in grass script. The rabbit hair brush continues to be used and the paper is the same size, although in the 8th century a thicker paper came into use. This was the period when the Tibetans occupied the Dunhuang area and therefore paper and writing materials from central China were no longer readily available. The verso of old manuscripts -- most especially secular manuscripts -- was often used, but paper was also made locally using hemp cloth from the 9th century. This was hard, thick (0.13mm), and larger than the previous standard for Buddhist texts (although it was sometimes trimmed). It is also believed that wooden brushes were used, resulting in poor ink coverage. Left:Participants answering questions at the symposium. From l. to r.: Dr Sarah Fraser, Dr Chhaya Haesner, Lilla Russell-Smith and Dr. Zsuzsanna Gulasci. This summer, from 7-12 July, the 35th International Congress of Asian and North African Studies (ICANAS) took place in Budapest. The International Dunhuang Project was invited by Professor G. Hazai, President of the Congress, to organize a special symposium during the 35th ICANAS. 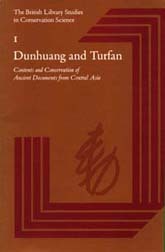 The symposium, entitled 'Dunhuang and Turfan' was organised by Simone Chr. Raschmann and Susan Whitfield and held over one and a half days, on 7-8 July. Originally scheduled for two full days, the symposium had to run to a very strict timetable which did not allow much time for discussion. The small room which it was designated by the ICANAS organizing committee, was overcrowded and unfortunately people had to be turned away. t was a great pleasure to have the President of the 35th ICANAS himself at the opening session. Recognized authorities in the field of Central Asian scholarship who were also Honorary Presidents of the Congress -- Professor Louis Bazin, Professor Janos Harmatta and Professor Denis Sinor -- took an active part by chairing sessions and, in the last two cases, also reading papers. The Symposium covered two main subjects: 'Silk Road Archaeology' and 'International Scholarship'. Twenty-three scholars from eleven countries responded to the invitation to present papers (see abstracts below) and between 60-80 participants took part. The International Dunhuang Project was officially invited to organize another symposium, during 36th ICANAS, to be held in 2000 in Montreal. Lilla Russell-Smith drew attention to the existence of a group of paintings within the Stein and Pelliot collections, which shows a remarkable degree of Uygur influence in Dunhuang art. Some of these paintings have already been noted for their difference from the 'mainstream' Dunhuang style. The increasing isolation of Shazhou from the rest of China after the fall of the Tang dynasty has been identified as the main reason for the contrast between ninth and tenth century Dunhuang style by Chinese and Western authors alike. As described in detail during the talk, at the same time as the influence of the Chinese court art weakened, specifically Uygur stylistic features appeared in the art of Dunhuang. These can be observed by thorough stylistic comparison of the Dunhuang banners to the wall paintings and fragments on silk and paper from the Turfansammlung in the Museum fur Indische Kunst, Berlin, and to other examples of Uygur art. In the case of several paintings the similarities are so striking that the question has to be asked whether they were executed in Dunhuang at all, or brought there from Khocho. It was argued that it is more likely that these paintings were painted for Uygur donors in Dunhuang for several reasons. There was a strong Uygur presence in Dunhuang from the beginning of the tenth century. Uygur donor figures have been identified in some of the biggest caves sponsored during the reign of Cao Yijin, the governor of Shazhou who had an Uygur wife. The links between the Uygurs and the Chinese in Dunhuang were especially close during the tenth-eleventh centuries as more recent historical research has shown. Many of the paintings in the identified group have Chinese inscriptions and the donors bear Chinese names. For foreigners settling in Dunhuang it was usual practice to take a Chinese surname; in Khocho however, the names and incsriptions are mostly in Uygur. The hairstyle of the lady figures is identical on several pieces from the Dunhuang group and as this hairstyle does not appear in the Khocho material, it probably reflects a local fashion in Shazhou. Further similarities to Uygur art were pointed out, such as the pattern and colour combination of the carpets, which are in stark contrast to the carpets usually represented in Dunhuang. The hybrid style of some paintings probably reflects a later stage of development in Dunhuang art. On these paintings the Uygur features were combined with characteristics of Xixia (Tangut) style. When compared to Xixia caves from Dunhuang or banner paintings from Karakhoto, many details are similar. It is likely that such paintings were executed in the period when the Xixia ruled an Uygur dominated Shazhou in the eleventh century. Lilla Russell-Smith is currently working on a book concerning this topic which will be published by Brepols Publishers in the new series entitled Dunhuang Studies. Full details of the series, which will be launched in 1998, will be given in the next issue of IDP News. The manuscript collection at the Institute for Oriental Studies, St Petersburg, is large and diverse. Nadia Brovenko explained one aspect of the conservation work -- of Islamic manuscripts -- and illustrated her talk with slides. The Russian scholar, V. Ivanov, hypothesized on the function of so-called 'foreign signs' which exist in the Tokharian script. In her paper, Svetlana Burlak argued that this hypothesis is untenable and that the 'foreign signs' had no influence on ancient Turkic script. Professor Clark reviewed and challenged Professor Moriyasu's hypothesis that it is possible, by means of language and script, to date some Uygur civil documents to the pre-Mongol period. Dunhuang manuscripts can help us to understand the life of those artists who painted and sculpted the Dunhuang caves in the first millenium. Dr Fraser considered the terminology used in financial accounts of revenue and expenditure in Dunhuang monasteries and argues that they reflect a professionalisation of the painter's practice during the early tenth century. The goal of Dr Gulasci's paper was to introduce a strategy for the secure identification of a Manichaean artistic corpus, taking as a starting point the definition that recognizes a work of art as Manichaean only when it is found in a Manichaean religious context. Her research was based on the Turfan remains in Berlin. The art of Central Asia is syncretic in nature and, Dr Haesner argued, one comes across many confusing iconographical features which often have little relation to Buddhist iconomgraphy. In her talk she discussed one such work: a banner fragment from a cella in Hasar Shahri. Sir Aurel Stein is best know for his expeditions to Dunhuang, but he made many other advanaces both through his expeditions and his scholarship.Professor Harmatta discussed several specific instances of the latter which are often overlooked. The Japanese expeditions to Chinese Central Asia led by Count Otani collected many manuscripts and artefacts which have since dispersed into both private and public collections inside and outside Japan and whose provenance is not always identified. Professor Hattori discussed several of these objects which have been recently 'rediscovered' in Japan. Between 1959 and 1975 Chinese archaeologists excavated thirteen sites in cemeteries north of Astana and east of Karakhojo in Turfan County. Further work has been carried out since. Only a small number of tombs have remained unrobbed but many well-preserved wooden objects were left behind. Dr Juhl discussed some of the characteristic features of burial practice in the Turfan area based on examination of these objects. From a survey of ninth-tenth century texts from Duhuang and Turfan, Professor Klyastorny showed that runic script was used in the cultural, business and military spheres up to the eleventh-century. The Sandong fengdao kejie (Rules and precepts for worshipping the Dao according to the Three Caverns), is the first manual of monastic rules in medieval Daoism. It was Professor Kohn's contention that, although the bulk of the extant text existed in the mid-seventh century, it did not remain static but was expanded during the Tang dynasty only to be later reduced to the shorter version that is in the Canon today. Gail Larminaux gave an overview of the work done by the UNESCO Project, 'Integral Study of the Silk Roads: Roads of Dialogue', since its inception in 1988. S.M. Dudin (1863-1929), was a member of the Russian expeditions to Turfan (1909-1910) and Dunhuang (1914-1915) led by Academician Oldenburg. Perhaps his greatest achievement, as yet unpublished, is the photographic record he kept. For example, there are about 2,000 photographs and pictures prepared by Dudin at Dunhuang. The commentary written by the seventh-century monk, Xuan Fan, to a preface and postface to the Chinese Buddhist Canon by the Tang emperor Taizong and Crown Prince (later Gaozong) respectively, has long been lost. Professor Nishiwaki has now identified a fragment as belonging to this commentary and discussed it here. Professor Oda discussed the question of the date and place of the translation of the Sakiz yukmak yaruq Sutra into Uygur. He concluded that it was translated in the Turfan area and probably dates from the latter half of the ninth century, or possibly the start of the tenth century. The Uygur translation of the biography of Xuanzang has long been the subject of study but a full transcription is not yet available. Professor Olmez and his colleague, Kahar Barat, have been working on the text and in his paper he discussed the names the Turks were using for the neighbouring peoples and for geographical features. Professor Pinault's paper addressed the significance of the Yanqi manuscript in Tokharian A of the Maitreyasamiti-Nataka (ca. 8th century) which adds very important complements to other manuscript fragments of this text in Turfan. Dr Raschmann was to discuss the question of whether there were really different Uygur translations of the Suvarnaprabhasottama Sutra, given that there are major textual differences between those manuscripts in the Berlin Turfan collection and more recent manuscripts in St. Petersburg. Unfortunately, the tight schedule did not allow Dr Raschmann time to present her paper. In the course of the preparation of a catalogue of Middle Iranian fragments in Sogdian script of the Berlin Turfan collection, four fragments were found whose handwriting showed they belonged to the same manuscripts. These have been identified by Werner Sundermann as part of the Manichaean layman's confession, Xwastwanift. Dr Reck discussed these fragments and their significance. In his paper Professor Sertkaya reconstructed two Uygur contracts with the help of material collected by Resid Rahmeti Arat during his work on the Berlin Turfan collection. The originals in Berlin had been partially destroyed during World War II and the material, which also includes photographs and is now kept in Istanbul, is the only record left. Professor Sinor paid a moving and amusing tribute to one of the greatest early sinologists, Paul Pelliot. A survey of scholarship in China on Central Asia -- defined as the region from Xinjiang to the Iranian Plateau -- in the following categories: 1) archaeology; 2) historical geography; 3) political history; 4) economic history; 5) cultural history. This was a survey of the Sanskrit manuscripts of the N. F. Petrovsky Collection in the Institute for Oriental Studies, St Petersburg. Aurel Stein first visited London in 1884 as a young man of 21. He wrote extensively about his experiences and impressions in his letters to Rudolf von Roth, and Dr Zeller has made a study of these. Central Asia is increasingly recognised as an important area to study in its own right, rather than through the glass of surrounding civilisations such as China and India. It has a rich heritage of sites and artefacts, many of the latter scattered throughout the world and many of the former threatened by neglect through lack of resources or by regional political unrest. The documentation of the sites and artefacts is therefore a matter of some urgency as an essential foundation for understanding the history, culture and importance of this region. It was with these considerations in mind that the Indira Gandhi National Centre for the Arts (IGNCA) in New Delhi presented a resolution to the UNESCO General Conference in 1995 to document Central Asian antiquities. The resolution was adopted and IGNCA was given the responsibility of conducting a feasibility study of such a documentation project in co-operation with the International Institute for Central Asian Studies, Samarkand. The feasibility study was carried out in two parts: the first comprising of visits to important repositories of central Asian artefacts in Central Asia, Russia and Europe by Dr Arup Banerjee (Associate Professor, Slavic and Central Asian Studies, IGNCA), and the second, a conference, held at the India International Centre, July 15-18, 1997. The conference heard reports and presentations from scholars, museum directors and other experts in the field. On the penultimate day it was agreed that the documentation of Central Asian sites and artefacts was both desirable and feasible, and a working group was then chosen to draft recommendations for the implementation of such a project. Dr Banerjee and the UNESCO representative, Mr Doudou Diene (Director, Inter-Cultural Programme), drafted the resolution. The resolution and recommendations were put to the whole conference and passed with a few minor changes. The resolution will now go forward to the 1997 General Committee of UNESCO. If accepted, an international consultative committee will be formed to oversee the implementation of the Project. The initial stages would probably involve the documentation of material in Central Asian (ex-Soviet Union) Museums. Dr Susan Whitfield was invited to participate in the conference. She gave a presentation on the experience gained by the International Dunhuang Project, chaired a session and offered IDP's support for the IGNCA initiative. Developments will be reported in IDP News but if you would like further details, such as a list of participants or a copy of the resolution, please contact IDP. This is a three-year project funded by the Henry Luce Foundation Inc. that brings together a team of twenty-five Chinese and American scholars who work within the disciplines of archeology, history, art history, and religious studies. In May 1996 the Chinese and American participants met together in Urumqi and Turfan, where they surveyed Toyok (Tuyugou), Sengim (Shengjinkou), Gaochang, Jiaohe and the nearby Yarkhoto caves, Bezeklik, and the Astana graveyard, in addition to the holdings of the Turfan and Xinjiang Museums. During the second year of the Project (the academic year 1996-1997), four scholars from China (Deng Xiaonan, Rong Xinjiang, Wu Jianguo and Zhang Guangda) visited Yale, where they compiled a Chinese-English database (using Microsoft Access and TwinBridge software for Chinese) for students using the most important published materials from Turfan. Each entry includes key words, the title of the document or artefact, the date, the languages, publication information for photographs, transcriptions, translations, and references to selected articles in the secondary literature. The indexed materials will include the site reports of Huang Wenbi, the ten volume set of documents Tulufan chutu wenshu (now available in four volumes with photographs), Klimkeit's Gnosis on the Silk Road, the Kodansha/Wenwu chubanshe joint publication of the Xinjiang Art Museum's holdings, and the brief archeological site reports published since 1949. Once completed, this database will be available in hard copy as well as a disk format. The American participants met in June, 1997, to present draft versions of their papers on the following topics: Buddhism and Buddhist art at Turfan (Janet Baker, Valerie Hansen, Denise Leidy, Nobuyoshi Yamabe); the presence of Sogdians at Turfan and the extent of Persian influence (Angela Sheng, Jonathan Skaff, Oktor Skjaervo, Zhang Guangda); the interpretation of artefacts found in the Astana tombs (Albert Dien); the history of women (Deng Xiaonan, Judy Chung-Wa Ho); artists' practice (Sarah Fraser); the equal-field system (Victor Xiong); and architecture (Nancy Steinhardt). In the coming year, 1997-1998, the final year of the Project, the database will be completed. The project will conclude with a conference in New Haven scheduled for July 11-12, 1998 in which the American and Chinese participants will present the completed versions of their papers. This conference will be open to interested members of the public, who should feel free to email the director of the project, Valerie Hansen (valerie.hansen@yale.edu) for further details. The 'Sermon on the Soul' is a Manichaean tract largely reconstructed from some sixty fragments in Parthian, Sogdian and Old Turkish. It played a large part in East Manichaean tradition, attested by more than thirty manuscripts, and inspiring later East Manichaean works -- even hymns in Chinese. The sermon underscores the identity of individual souls and the cosmic viva anima, the spiritual nature of the soul and the five light elements, and it describes the beneficient, meritorsious activities of the world soul on behalf of worldly creatures. It presents an unusually optimistic description of life on earth and is remarkable for its well-designed parables. This outstanding example of Manichaean prose literature contributes considerably to our knowledge of Manichaean doctrine. This new guide takes the reader from Xi'an and Beijing in the east to Islamabad, Bishkek, and Almaty in the west on a variety of ancient trade routes including some barely mentioned in other guides, if at all. The name of every town, sight, restaurant, and hotel is given in Chinese characters as is the name of every street mentioned in the text or on the many city maps. Every single romanised Chinese word used is tone-marked to help pronunciation. Directions are given in considerable detail, as well as instructions as to how to use public transport to reach various sights, including those where this is said to be impossible. Readable historical and cultural material includes a guide to the principal Silk Route collections in museums overseas, an introduction to how Mandarin works (as well as a detailed language section), and the stories of many Silk Route travellers, both famous and obscure. Practical information covers how to obtain invitations for Kazak visas, detailed instructions for tackling local foods, advice on avoiding overcharging both private and semi-official, and much more. China: The Silk Routes is available at book shops world-wide by quoting the ISBN: 1-86011-052-5. Kenneth R Seddon is Professor of Inorganic Chemistry at The Queen's University of Belfast and an EPSRC and Royal Academy of Engineering Clean Technology Fellow. Dr Peter J. Gibbs is a Research Fellow in the Chemistry Department, University College London. READERSHIP: professional conservators, researchers in paper chemistry, librarians, manuscript specialists, postgraduate students and analytical chemists. The discovery that that the dye used on some of the yellow manuscripts in the Stein collection at the British Library was not huangbo has resulted in further research on traditional dyes in China and Central Asia. Work carried out by Professor Kenneth Seddon and Peter Gibbs over the past several years, first at Sussex University and more recently at the Queen's University of Belfast, developed methods to analyse the dye on fragments of paper (reported in previous issues of IDP News). Most of the tests, which were mainly executed on tiny fragments from the St. Peterburg collection of manuscripts, showed that the dye used contained three alkaloid chromophores: berberine, palmatine, and jatrorrhizine. The traditional Chinese dye obtained from the Phellondendron amurense (Amur Cork Tree) and known as huangbo, was also analysed and found to contain the same active compounds in the proportions: 60-65% berberine, 30-35% palmatine, and a small percentage of jatrorrhizine. Prior to the forgeries workshop, it was decided to analyse small samples of a selection of manuscripts obtained by Stein on his third Central Asian expedition. These 600 or so scrolls are those which are open to suspicion of forgery. As John Fields and Professor Seddon reported at the workshop, the dye found all but one of the samples did not contain berberine, the principal component of huangbo, and is therefore dyed with another substance. On his first expedition to Central Asia in 1900, Stein had quizzed Islum Akhun, a forger of fragments in a made-up script which had been bought -- unknowingly -- in the last decades of the nineteenth century by the British and Russians. Islum Akhun gave a detailed description of how he made the forgeries, including the dyeing process. The sheets of modern Khotan paper were first dyed yellow or light brown by means of 'Toghrugha', a product of the Toghrak tree, which, when dissolved in water, gives a staining fluid. (Ancient Khotan, p. 512). 'Toghraq' is the Uygur name for the black poplar tree (Populus euphratica Oliv., Populus diversifolia Schrenk, Huyang in Chinese) and 'Toghrugha' refers to its sap. When the bark is cut this flows and forms into lumps. This has traditionally been used by the Uygurs as baking soda in cooking and in soap, and is listed as a medicine in Uygur and Chinese materia medica, but its use as a dye was also known. Another candidate is the dye principally used for dyeing textiles yellow. This is obtained from the flowers of the Japanese pagoda tree (Sophora japonica L. or Huaishu in Chinese). Interestingly, Ernest Henry Wilson in his travels round western China at the beginning of the century (the time when forging of Dunhuang manuscripts is alleged to have started) noted that 'Coal-tar products ... analine dyes ...are available on sale in every town and market village in Western China, made up in small bottles and imported from Germany' (A Naturalist in Western China (2 vols. ), Methuen, London 1913, vol. 2, p. 86). He also mentions several other local yellow dyes obtained from trees. The British Library is currently trying to obtain samples of these various dyes. These will then be sent for analysis and compared with the results obtained for analysis of the third expedition Stein material and the Islum Akhun material. It is hoped that the dye used for the former will thereby be identified. This may be a step in the more secure identification of forgeries. A recent article about this work is Micheal Freemantle's, 'Ancient Colours, Modern Analyses: Chemical analyses of ancient scrolls yield critical information for conservation', Chemical and Engineering News, August 11, 1997, pp. 36-40. Thanks are due to Dr Yasin Ashuri, Professor Wu Min and Mme. Krishna Riboud for their help. Organised by the Central Asia/Silk Road (CASR) Working Group and sponsored by the Silk Road Foundation, this conference will bring together scholars from the US, Europe and Asia to exchange reseach on the cultural setting of the Silk Roads. A wide range of problems associated with the use of computers in archiving, cataloguing, and indexing of material and written sources will be considered by individual presentations, short communications, workshops and computer presentations. The papers will also be published in September 1998. Participants will be notified of acceptance or rejection by February 28, 1998, and full papers will be required by the end of April. Details of these will be posted on the EurAsian Orientalist Server (http://www.orient.ru). This conference, the first of its kind, is supported by the Association for Asian Studies (AAS) in the United States and the European Science Foundation (ESF) Asia Committee, and is being organised by AAS and the International Institute for Asian Studies (IIAS) in Leiden. It aims to be broad and inclusive, with a formal programme of panels, roundtable discussions, posters and papers. There will also be film screening, book-presentations, music performances, and other accompanying events, and a large exposition of publishers and other organisations in the field. It is expected that there will be 400-500 participants from Europe, Asia and the United States. The Circle of Inner Asian Art (CIAA) is organising its regular lecture series at SOAS, London, and speakers this term will include Ma De from the Dunhuang Research Institute and Aleksandr Naymark from Bloomington, Indiana University ('Sasanian Iran in Shaping of Sogdiana'). At the ICANAS meeting there was a workshop on 'Electronic Resource Development', as a result of which a group was established to promote information about electronic resources in Asian studies. Details of the group (provisionally called SEER) are available from Jost Gippert: gippert@em.uni-frankfurt.de. The mailing may be incorporated with the ASIANDOC list. For details of this contact Maureen Donovan: donovan.1@osu.edu. The International Dunhuang Project has been successful in its application to the UK Heritage Lottery Fund for a three year project to catalogue and digitise the Stein collection at the British Library on the IDP database. An assistant for the Project has been appointed and will start work in January 1998. Part of their responsibility will be scanning and preparation of images. The Project allows provision for cataloguing of the Tangut and Tibetan material. This will largely take place in 1999 after the move to the new building at St. Pancras. The Chiang-Ching Kuo Foundation, primary sponsors of the Project over the past three years, have generously provided a further year's funding to enable to Project to establish the Project database at the other IDP member insitutions and to launch the database on the Internet (see below). Dr Susan Whitfield has been working with Michael Kaye, Fraser Trust Ltd, in continuing to develop the IDP database. Several new features have now been added, including the possibility of adding multiple catalogue screens accredited to different authors and automatic production of titles with diacritics for Sanskrit titles. Copies of the database structure have been sent to various other institutions involved in cataloguing both oriental and occidental manuscripts. Anyone wishing to know more about the structure or wanting a copy can contact IDP. Over the next three months the screens for the readers will be further developed in conjunction with Internet screens. It is planned to go online in 1998 after the move to the new British Library at St Pancras. In addition, methods of linking and manipulating large numbers of high resolution images are being evaluated. A report will be produced in early 1998 and the best system chosen. Anyone wanting further details or willing to offer advice based on their own experiences should contact IDP. The final volumes of the 14-volume facsimile publication of the non-Buddhist Chinese material from Dunhuang in the Stein collection, Yingzang Dunhuang wenxian, (Sichuan People's Publishing House, Chengdu, 1990-1995), have recently been received at the British Library and distributed to subscribers. Volumes 12-14 contain facsimiles of previously unpublished manuscripts recently catalogued by Professor Rong Xinjiang. A fifteenth volume containing supplementary material, essays and indexes is in preparation. The facsimile volumes of the Dunhuang corpus at the Institute for Oriental Studies, St. Petersburg (Shanghai Chinese Classics Publishing House and 'NAUKA' Publishing House, Shanghai 1992-), will contain the entire collection of Dunhuang and Turfan manuscripts along with the photographs of the Mogao cave site at taken by S. M. Dudin during the Oldenburg expedition. These have not been previously published and should prove of great interest to scholars worldwide. The schedule for the forthcoming volumes in this publication is not yet fixed. The British Library was very sorry to say goodbye to Dr Ulrich Pagel, its Tibetan Curator, who left in August to take up a teaching post at the University of Washington in Seattle. Dr Pagel had made a survey of all the Stein Tibetan woodslips and fragments over the past year and his work is an invaluable addition to the IDP database. Several eminent scholars visited the British Library for the workshop on forgeries and some stayed on to do more research. Professor Fang Guangchang (Institute for World Religions, Chinese Academy of Social Sciences), was awarded a British Academy Visiting Professorship and was therefore able to stay on for three weeks to continue work on his catalogue of the Stein Buddhist fragments. He will return again in 1999 to do more of this work and we hope that his research will start to be added to the database shortly. Dr Susan Whitfield has given demonstrations of the Project at conferences in Budapest, India and Copenhagen over the past three months. She has been awarded a Japan Foundation Fellowship to spend the last three months of 1997 at Tokyo University (Department of Oriental History). She will be looking at Dunhuang manuscript collections in Japan, talking to scholars and conservators and exploring the possibility of establishing Japanese IDP database centres while there. She will also be showing the database at the Annual Meeting of the Electronic Buddhist Text Initiative (Kyoto, October 23-26), and at the Silk Roads Conference (Berkeley, December 6-7 (see above)). She will be contactable as usual through email while away, but please leave non-urgent queries until her return in January.